A blonde and a redhead went to the bar after work for a drink, and sat on stools watching the 6 O'clock news. A man was shown threatening to jump from the Brooklyn Bridge, and the blonde bet the redhead $50 that he wouldn't jump. 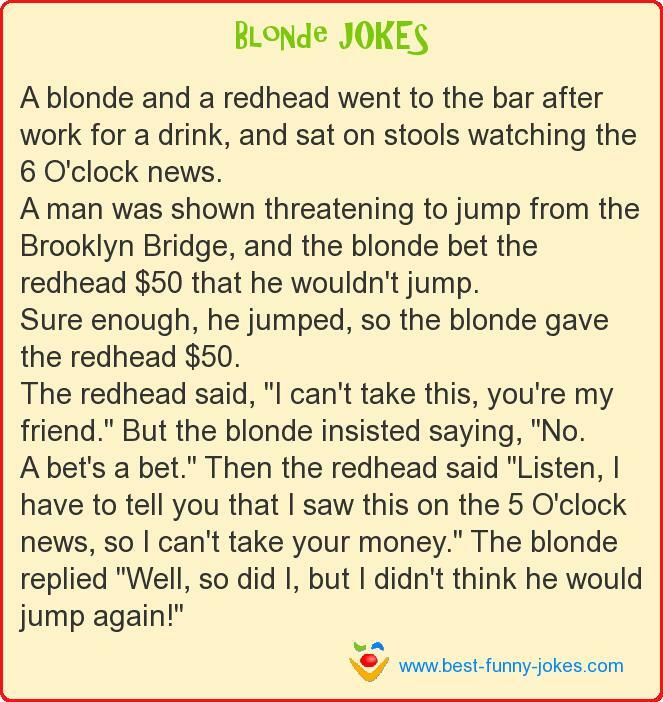 Sure enough, he jumped, so the blonde gave the redhead $50. The redhead said, "I can't take this, you're my friend." But the blonde insisted saying, "No. A bet's a bet." Then the redhead said "Listen, I have to tell you that I saw this on the 5 O'clock news, so I can't take your money." The blonde replied "Well, so did I, but I didn't think he would jump again!"